What a surprisingly confident debut! 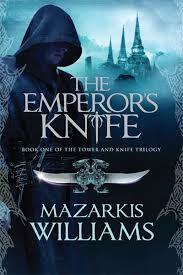 Well-written, hard-hitting, fast-paced, and quite enjoyable, The Emperor's Knife is a fitting introduction to Mazarkis Williams's new fantasy series, the Tower and Knife Trilogy. The Emperor's Knife follows three main characters (alongside a host of interesting secondary personalities): Sarmin, a forgotten prince who has been locked in a tower for much of his life after watching his family get executed; the Windreader Mesema, who is brought to the Cerani Imperial Court from her tribal grasslands (ostensibly to marry Sarmin) and soon finds herself sucked into a deadly game of Cerani politics; and Eyul, an assassin who has long been burdened with the task of spilling royal blood. It was Eyul who executed Sarmin's brothers--for it is only the Emperor's Knife, the knife Eyul wields, that is fit to shed royal blood. The three protagonists stories intersect around a plague that has been running its course through the capital, a plague that takes shape as a pattern on its victims' bodies. The plague is so rampant that some suggest it has even spread to Emperor Beyon himself. The story really succeeds as a character-driven drama. Williams creates wonderfully complex set of characters to whom the reader can relate. For Mesema, this is a coming-of-age tale of a young tribeswoman subject to the politics of the capital. Her relationship with the at-times-cruel Emperor Beyon was at times a source of anxiety, and at other times quite touching. For Sarmin, the question is whether his long years of captivity made him dangerous and cruel, or kind, compassionate, and committed against slavery and confinement of all types. And Williams highlights the inner conflict and the divide between loyalty and duty in the Emperor's assassin, Eyul. In some aspects, the world building was absolutely fantastic. The fact that the Williams set The Emperor's Knife in a non-Western-influenced (Middle Eastern, to be a bit more specific) setting was refreshing, to say the least. So were the magic systems in the Cerani world. First, elemental magic. Used by the mages of the realm, this type of magic forcibly fuses an elemental within a human mage's body. Although at first the elemental's consciousness is subsumed into and controlled by the human mage, as the elemental grows in power this switches, and the elemental eventually takes over. I appreciated that twist, showing the danger inherent in magic and why there are so few magicians throughout the world. Second, pattern magic, an older type of magic used by Sarmin and the arch-villain of the story, the Pattern Master. Mysterious and arcane, pattern magic nevertheless captures the imagination--once a pattern forms on a person's body, that person is either driven insane or finds his or her conscious mind subverted, controlled at the whims of the pattern's master. Thus all who show the pattern's tell-tale marks are put to death... until the pattern finds itself a new host in the Emperor Beyon. Lastly, windreading. This type of magic appears somewhat similar to pattern magic, and is used by those in the Windreader tribe. Other world-building elements are rather poorly fleshed out, however. Take, for instance, the culture and life of Cerani. Williams provides a fantastic glimpse into court life in the Cerani Empire, with all the intrigues and political battles that entails. But one never gets a sense of a world outside of the court. Nor does the reader ever encounter people outside the court--one rarely sees anything akin to a bustling city, with its booming ports and busy marketplaces. In fact, the whole book feels as if only nobles and their guardsmen populate the supposedly vast imperial capital. Another small problem had to do with the book's pacing. The book begins to drag in the middle, with Mesema foundering in the capital, and Eyul on his quest through the desert. Moreover, the conclusion is thrust on the reader way too quickly. At times, this book felt more like a beer to be gulped down instead of scotch to be sipped. Williams does engage in an interesting subversion of common literary tropes, which some readers may find quite well done. This involves a minor spoiler, so feel free to skip ahead if you want to remain blissfully ignorant. In this case, the author is dealing with the trope of the weak and subservient woman. After setting up the trope, the author subtly (and later blatantly) subverts it, revealing how in many senses women were true masters, or the major cogs in the overall political machine of Cerani life. It was particularly well done, but it left me with a sour taste in my mouth. Why set up the masculine world trope only to subvert it? Is this even necessary anymore? I have always believed that the best way to subvert a trope of a weak woman in society is by foregrounding strong women and their exploits. I would have much preferred this to any big reveal that women were in many senses the true (if behind-the-scenes) leaders. Bonuses: +1 for pattern magic; +1 for well-done characters. Penalties: -1 for problems with pacing; -1 for the sense that the world was only populated with nobles and guardsmen. See why our scoring system is awesome here.